Yomega - Bright LED lights and Transaxle Performance! 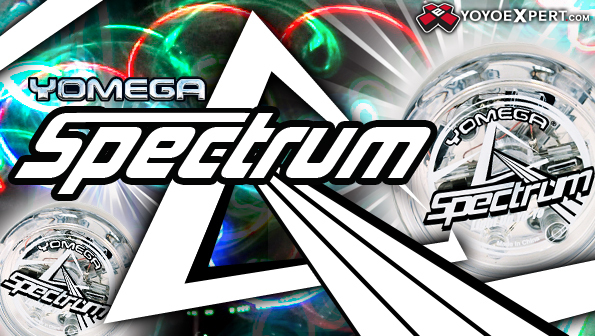 The Spectrum is the newest light up yo-yo from Yomega. It features a multi-color LED light that gives you bright vibrant bursts of light with every throw of this cool yo-yo! Once you see it in action you'll agree that the Spectrum is one of the brightest light up yo-yos around. It is bright enough for a flashy day time performance but the dark is where this yo-yo really shines! Once the lights go down just break out the Spectrum and capture the crowds attention, instant entertainment! The bright lights of the Spectrum only shine while it's spinning so the batteries will last a long time and it comes stock with a trans-axle and starburst response system which will provide any level of player endless entertainment!